After years of unavailability, the three surviving episodes from the legendary horror anthology series Dead of Night finally come to DVD, released by the BFI on 28th October 2013, as part of GOTHIC: The Dark Heart of Film. First screened on BBC2 in 1972, Dead of Night offered a series of highly personal takes on psychological disturbances, often related to contemporary social anxieties. Rarely seen since its original broadcast, the Dead of Night series has been highly sought by fans of classic TV and British horror for decades. In what is perhaps the most terrifying of the episodes, four wealthy, middle-class friends (played by Clive Swift, Edward Petherbridge, Anna Cropper and Sylvia Kay) gather for Christmas dinner in a country cottage, only to find that the past will not rest while they feast. The professionalism of an experienced and respected airline pilot (played by Peter Barkworth) is placed under scrutiny when he encounters the ghostly apparition of a Second World War Lancaster bomber. A middle-class housewife (played by Anna Massey – Peeping Tom, Frenzy) becomes increasingly paranoid when her nights are interrupted by the terrifying and unexplained sound of a woman crying in one of the rooms in her new house. 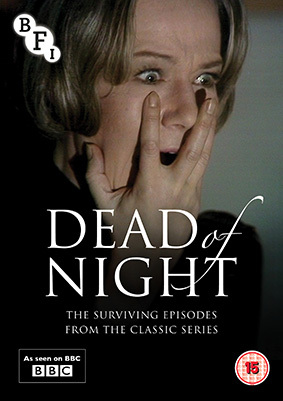 Dead of Night – The Surviving Episodes from the Classic BBC Series will be released on UK DVD on 28th October 2013 by the BFI as part of GOTHIC: The Dark Heart of Film at the RRP of £19.99.